A Pocket Full of Hope.. Which sometimes seems to be so naive..
Leaving you wanting for more. And let the hope in your heart sit tight!!! The Thriller’s Gone With You..MJ!!! 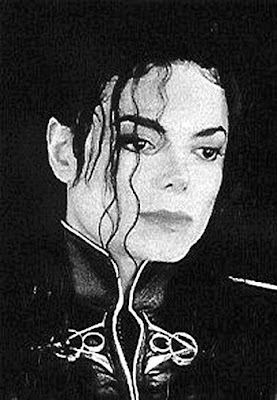 Michael Jackson…what does the name stand for? A lifetime dedicated to music..a lifetime full of fame and fortune ..a lifetime full of scandals..a lifetime full of accusations..but I think he is more of a legend that we should celebrate....that he is no more..
May god bless your soul and may you rest in peace …MJ!! I see people walking by happy, sad and gay. I see their freedom knows no bounds.. I watch in awe as they drop their massive anchor.. I find myself waving to every departing stranger.. I watch the beggars who are busy quicker picker upper.. I realize it’s time for the sun to say goodbye..
how much I love him and how much I miss being away from him. A Father’s day sale…what does it mean? It seems really funny that people who created this day also gave the retail industry a boost as hundreds of people totally forget the significance of the day or the person and end up spending the whole day shopping and hopping from one mall to another. In that sale mania the love and the respect for the man who gave us life is somehow lost. I too love shopping and am fond of “sale” but not a Father’s day or Mother’s day sale. In any case can your love for them be on discount by any chance? No, I don’t think so. It is not like I am against any such day but I really think that does anyone really need a day to remember the person who gave you life and made you what you are today…I don’t think so. It is just that in this modern day we just get rid of our responsibilities by buying a card and a gift for that loved one while a little time and love can really do wonders…. A Father’s Day or Mother’s Day really gives us an extra opportunity, another day in addition to the 365 to thank them for having us and giving us the most wonderful gift of all…the gift of life and the gift of their unconditional love and support. And this goes for my Dad…I really cannot express how much I love you and miss you. I remember you everyday as much as I do today. It’s been a long time since I last saw you and I promise we will see each other soon and till then take care and always remember I am still your little girl and I know that’s how you remember me.. The sun was not happy that day I guess….leaving a mark in the sky..
And the sun setting in the distance with a promise of another beautiful day……. No I am not a former inmate of Alcatraz Island …the famous prison off the San Francisco Bay often known as “The Rock” but only a visitor who visited the island almost forty years after the dreaded prison was officially closed down and converted into a museum. Each year millions of people visit this island to take in its unique history. The cell house, now empty of the dangerous criminals who were once housed there, still carries remnants of the dark events to which these walls bore witness. “While I am still breathing”….. was the opening line of the guided audio tour that we took… As soon you enter the main prison building a feeling of somberness prevails. Though no prisoners live there now but still it seemed that we were retracing their footsteps. But what the prisoners went through in that place is only for us to imagine. In the dining hall stands the board on which the menu for the last day of the prison remains unscathed..i don’t remember what the menu was but it was not something what we would fancy. In the kitchen the knives were mounted on cases so that if one is stolen the cook can raise an alarm…in spite of all this quite a few of them were indeed stolen and later used in attempts to escape from the island but most of them in vain….. The recreation center of the prisoners is something worth mentioning. It is rather a bare ground with a gallery on one side and a wall on the other side with a gusty wind blowing all year round. It is so windy over there that I could hardly stand at one place but the prisoners used to sit there for hours together because it was their heaven, it was the only place where they could have a piece of the life they missed..the sun ..the rain.. the winds..the clouds..and most importantly a birds eye view of the San Francisco city through a tiny hole on the door……. As the tour went on it took us to what they call “The Hole”….it is nothing but a pitch dark cell which was used to keep the prisoners in isolation..not a ray of light, not a sound ..nothing…it seemed almost it lacked anything and every thing fit for human habitation….the only thing human ..”While I am still breathing..."
My journey to Alcatraz ended as I boarded the ferry to come back to San Francisco rather to come back to civilization far from the icy coldness of the place.. far from the rigid silence of the prison walls which could say so much”if only walls could talk..."
One of the first things that comes to my mind when i think of Calcutta is the Howrah Bridge..the pride of Calcutta...the gateway to Calcutta.As a child going out of station seemed appealing because i got an opportunity to drive through the massive bridge..i looked in awe every time as my father showed me the Ganges and tried to teach me which direction of the river leads to Allahabad..my aunt's place..
People often say Calcutta appeals to those people who have lived there but the truth is that the city has touched every one who has ever been there in it's special ways.One thing that cannot be undermined is the spirit and hospitality of it's inhabitants. 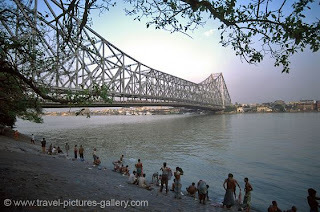 From the early morning activities at the Babu Ghat..to the busy streets of Park Street.to the narrow by lanes of North Calcutta...to the crowded Kalighat temple ..to the street hawkers of Gariahat.. to the maddening crowds at Eden gardens...the spirit of Calcutta is alive and well in it's people. Calcutta is a very cosmopolitan and modern city...orthodox in it's own way and modern on the other trying hard to embrace the new age. The best thing about Calcutta is it's cuisine..a mixture of many cultures.. In Calcutta you can find the most amazing "Biriyani" and at the same time the most authentic Indianised Chinese food.As a child i remember going to Park Street for dinner...and how can i even forget China Town..the hakka noodles and gravy chilli chicken have rocked the hearts of Calcuttans for years now and obviously i am no exception. Calcutta is a modern city built on the ruins of the past...though it's changing day by day yet it has managed to cling to it's roots.Calcutta today is as parochial as it is modern.It lives in the past as much as it lets it's past decay. India's first global city,it is littered with the remains of many worlds: the rickshaws brought in by the Chinese,the Mughlai food brought in by the Mughals, the hip hop and jazz culture brought in by the Americans and the everlasting impressions left behind by the British. What i thought would be the most happiest day of my life was also the most saddest day.Being a girl is a curse..while i was getting married i had my husband on one side and my father on the other..the two most important men in my life..together they are the pillars on which i stand..while my father is my foundation my husband is my reality.So really there is no question of making a choice and i can bet a daughter can never make that choice. Everyone told me that i never looked happy at my marriage...happy i was but the thought that i will have to go away and leave my parents behind was heart wrenching. All of a sudden i was the daughter in law of another family and officially i was the married daughter of my family..the identity with which i was born was taken away from me forever. I sometimes think of those people who start a new life with a partner who they hardly know. I have been fortunate in this case at least and i still say that i would have never left my home and parents if it would have been someone else. As we grew up we changed as persons but at heart we were and still are the same..time flied by and someone special came into my life....Deepayan.He was more of a friend than anything else.In this case also my great friends gave me great support. I loved my school so much that i ditched a very good college to continue my studies in my school after i passed 10th standard..Years flew by and gradually i reached the last day of school..It was one of the saddest day of my life..I hardly had a life without South Point..but i had to move on....and i did.